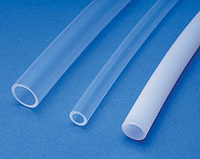 Saint-Gobain Performance Plastics careful selection of resin type, particle size, temperature and pressure produces smooth, non-porous, dimensionally stable tubing. Made out of polytetrafluoroethylene resin, Chemfluor® PTFE Tubing has the highest working temperature of any fluoropolymer tubing available today. It is widely used as a pressure tubing in general chemical applications such as delivery of natural gas and mineral oils, toxic gas monitoring and paint, varnish or adhesive delivery lines. Chemfluor® PTFE Tubing also services numerous applications in the automotive, electrical and appliance markets.